...and a great person, too. Sandy's skinny nurse get-up is a very funny piece of wardrobe which proves you don't need the big chest and big backside to have a funny nurse drag. Now, let me get this straight: Based on the makeup and costume, the visual aesthetic alone, you're saying this? Or is it because of his material, charm, comedy, etc? Do the two go hand in hand? I understand you're a huge fan of the "Classic American Circus Clown" look, but aren't things allowed to evolve? To change? For the better and for worse? I'm just playing Devil's advocate here; I do not know Sandy at all, and I'm very happy to assume he is brilliant and wonderful. But what is this about, Pat? I agree, Cashew, and Mike Snider and Billy Vaughan and Mitch Freddes and Alan Ware and...and... What's Bill Machtel doing these days? Cowboy Mike, Tommy & Tammy? My apologies to anyone I left out. Lose a frown...hug a clown. Gee, they like me. They really like me. Pat and Mike, thanks for the kind words. And to Brian...you have a point. All I ever did was look pretty and change clothes alot, but I was the one the parents wanted their kids with in the photo. 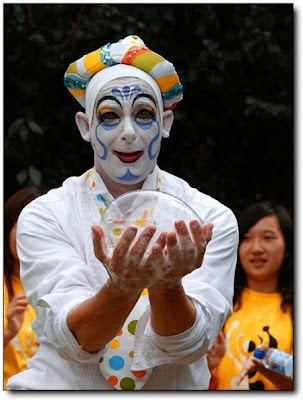 I had a ball in China in 2007 and met and worked with some wonderful performers. The Cole show that I saw in November "ain't what it used to be." One can't go back, but the few choice performing experiences that are out there for us make it all worthwhile. Oh, lord, she's rambling....someone tell her to shut up now. I think it's a style that's been forced out of style in America. As far a traditional circus clowns go, Ringling, being the largest clown alley, sort of set the standard for many generations, especially with Clown College. The look was determined by tradition and the taste of the owners. They liked auguste clowns more than whiteface, and tramps on the Ringling show pretty much were gone by the early 80's, replaced by "character" clowns. The current style has elvoved into a much more natural look partially influenced by the modern european faces and the upclose interaction they demand of their clowns nowadays. Some of the older, classic whitefaces were...intense...when viewed a foot from an audience's face. Not that their face didn't work or scared their audience, but distance did lend enchanment in some of the more extreame cases. Talent was the key to the successful clowns, no matter what they looked like. Sandy happens to be a very talented clown who works in both instances as a visual sight gag and a funnyman. I have had the privilege of working with Sandy on and off since 1979. He and I worked together as partners at the KimTom Festival. Not only does Sandy have that exciting, fantasy "Picture Clown" look, he is the ultimate master of directing the audience's attention to where it needs to be. We have all seen bad "pointer" clowns at Shrine circuses, but if you have the opportunity to study Sandy, you will see how much better he makes even a simple bit of business by thye way he assigns focus. What is basically lacking in the European style of "humanized" make-ups is the aspect of fantasy. To me they are not really clowns but funny people doing funny things in sort-of funny wardrobe. You need to go back and study the evolution of the three fundamental clown characters to understand that the white-face clown is a representation of all the higher attributes of human nature, such as cunning, valor, truthfulness, cleanliness, etc. In the ancient Greek scheme of things, he represents the element of air. You, Brian, have a definite Auguste personality, which plays on the base elements of human nature, a moish-mash of fire and water elements. The Charley is a real human, fallen from a high position, retaining only his dignity, which in a proper gag, is stripped away from him. The Greek element of earth. Those three are necessary and sufficient to perform any clown gag or function. The trend in clowning today is away from the two fantasy characters toward humans wearing funny outfits. In my opinion this leaves a big void. I think what Pat is trying to tell us is that we NEED real white-face clowns. You need to see close-up a child's reaction to a real white-face clown such as Sandy, Mike Snider, Duane Thorpe, Albert White, etc. They are usually awe-struck and spellbound, like running into Santa Clause in person. If you ever get a chance to work a classic clown trio of Joey, Auguste and Charley you will finally get it. Sandy, back in the day on CBCB in '78 was just as classy a showpiece clown then as he appears to be in the pictures from the Kimtom Festival of 2007. He always added color and style to every bit or gag he was in and was truly a "team-player" and a genuinely nice person to work with. He had then and appears to still have, now, the flamboyant class that has been sorely missing from circus since the days of clowns like Albert White, Ernie Burch... the list goes on. Thank you, Sandy for seeing and being part of that great, "lost" art of classic clowning. Greg, the truth is that the management of Ringling for many years until the passing of Irvin Feld, preferred white-face clowns. Under North, some of them even had special sweetheart clauses written into their contracts. Whitefaces have not been forced out of style, but they are going by attrition. You give me any sensible show owner who has the choice of hiring either an Auguste or a Joey at the same price and terms (this is assuming that they are not actually trying to hire a truck driver, electrician, cook or welder, but a real clown), and the producer will pick the Joey. What changed was 1) the kids at Clown College started to fear becoming whitefaces because of being branded as homosexuals and 2) everyone wanted to emulate Lou Jacobs. I totally concur with Sandy that the parents want their kids to have their photo taken with the picture clown, and outside of Lou Jacobs and Leon McBryde, very few Auguste clowns have that certain something that the public craves. As for what Nicole Feld is dishing out clownwise to the public, she needs to go study the three types and learn what makes each tick and why those three types resonate with the public. Executive fiat does not necessarily mean correct. Man... talking make-up? That's like politics and religion rolled into one on this site! To all those people I would just like to say... "Whooo-ie"!!! I guess I was just ahead of my time by about 3 decades. So far all the clowns that have been mentioned were/are outstandingly talented clowns, irregardless of the style of make-up they wore/wear. This being the case ... I do not believe that you can, with concrete judgement, state from these examples that a child is more drawn to a white face versus auguste versus tramp. I am of the school... it's not what you wear, it's how well you wear who you are. The idea of "less is more" should not be used as an excuse for mediocrity. 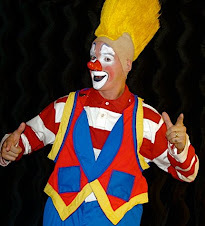 Disappointedly, I find many clowns who choose to wear limited make-up, do this more out of laziness than as a method of growth that betters their talent and connection with the audience. For what it is worth...when I was a teenager I was fortunate to have many mentors who were gracious with their time and advise. Dennis Stevens on Beatty-Cole told me that I was too tall to be a tramp clown (6'3"). I stayed with auguste and then when I arrived at clown college at the ripe old age of 18 ('74) Bobby Kay suggested that I go for the white-face because of my height. Hence, I have two make-ups; the auguste I have used the most; the whiteface for those spectacular gala events. But, I haven't had it on in so many years I forgot the last time. I think the biggest attraction to the "comical make-up" is time and effort it DOESN'T require, or as one veteran clown on RBBB called it, "Mexican make-up". Sandy is correct, if you put a traditional whiteface clown among a group of augustes or mini-makeups, the people will flock to the whiteface. When in the ring, you are there to be funny -- however you get to the "funny" is what is important. Sandy -- do you have a photo of your nurse wardrobe? I know you have it somewhere...send it to Pat! Wow! Fire in the Disco! Hi, Elmo! Now, nowhere here does Pat mention talent. He does not say, "Sandy Kaye is a brilliantly gifted and funny clown" Sandy Kaye may well be all of these things...it may be common knowledge that Sandy Kaye can kick Bill Irwin and Barry Lubin's asses in a funny contest any day of the week. I may be the one lacking that common knowledge...kind of like how everyone 'knows' Brecht and Weill never really got along. All I'm asking is: is Patrick suggesting Sandy be hired by every American circus based on talent OR on aesthetic? I do not want to challenge his answer to that question, I just want to learn the answer to that question. That's all. And he's allowed to answer 'Both'. But he didn't write about both, which is why I'm confused. That 'common knowledge' thing again. And to Sandy- Hi! In all the hubbub, I may have forgotten to say, you look beautiful, and the people here as well as the audiences in China seem to adore you. It's nice to make your acquaintance, and I'm sorry to get you in the middle of this when all I want to do is crawl up inside Pat's brain a little deeper...which is as frightening as it sounds. Huh...Brecht and Weill never really got along? the management of Ringling for many years until the passing of Irvin Feld, preferred white-face clowns. Under North, some of them even had special sweetheart clauses written into their contracts. I agree with that 100%. The key statement is "with the passing of Irvin Feld". Kenneth and Nicole seem to want a different look to give their time at the helm of the GSOE a distinct style. Ringling and/or Clown College used to set the example of the type of performer/clown/act that represented the top of it's field, as far as circus clowns in America go. With so many other opportunities for circus performers and clowns like theaters, crusie ships, festivals, street busking, fairs, etc, the art form has changed and with it the "look" of the artists who create it. Would Felix Adler be successful in a black box clown show? And would the clowning of Brian Foley succeed as well in an alley of 28 other clowns all wandering the hippodrome track with sight gags? Both types work very successfully in their venues and with their styles. Funny is funny, and clowning is clowning. Big shoes ,and red noses might define our art to the public, but does it really make all that big of a difference in the end if the audience is laughing? I agree, Greg. Context is key. I have full whiteface makeup (I paint my whole bald head, actually) that I rarely use, but I'm happy to do if...well, if the paycheck's right. My clowning would not suit RBBB well at all. That's one of the reasons I choose to not pursue that gig. Back to my original question: Patrick, what did you mean? "If the paycheck's right". Now there is a whole other world of conversation! I used to think the only way I could be true to my art was to maintain, without any input or discussion from outside sources, the look and visual elements of my clown character. But in order to make a living at my craft, I soon found that I had to adapt to the specific needs and wants of a particular employee. Not to say I would ditch the red nose for no good reason, and Kenny has a very good point on how many clowns today go the "less make-up" route out of laziness more than growth. But in order to grow as a performer I needed to stretch. 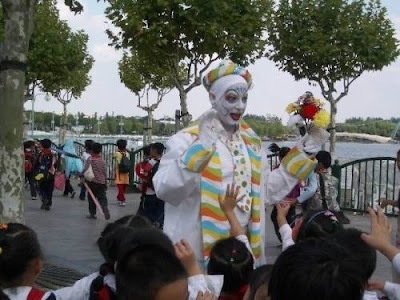 Those gigs where the traditional clown make-up was not desired by the producer, forced me out of my comfort zone and into some areas that I might not have explored otherwise. Are they all successful? No. Do I want to ditch the make-up and style I have used successfully for the past 25 years..no. But I do want to keep working, and in this day and economy, one must adapt to keep the kid in new shoes. I just it's great that there are opportunities like these festivals where so many different syles of clown can see each others work. One of the things that continually strikes me about a forum like this (a bb or single-post based thing like we have here) is that my exceedingly dry sense of humor does not translate well. That's my fault, but it's fascinating to see how I'm perceived. When I began studying clowning, it was in a theatrical context. Like Larry Pisoni says, think of clown as verb, not as noun. That said, when I studied with Mark Renfro, I went through many failed attempts at auguste faces, tramp faces, etc. We found a nice whiteface that I was able to then adapt to auguste and tramp faces more easily. Then (a few gigs later) I got a job performing on a cruise ship with some really great clowns, all with RBBB background and training, doing a Cirque-Style Character clown kind of show. So we did a cirque-style makeup, designed by another RBBB-trained clown. Then (a few gigs later) I met my current clown partner Matthew. He wears a nose, nothing more. Works for him. As we began working together, we decided to accentuate whatever physical similarities we may have had...not that we have many, but people are always mistaking us for brothers, even twins...out of makeup. He felt uncomfortable with a makeup...he's got a real funny expressive face anyway, so we went with a simple, silent film kind of look. As a character actor before anything, I am very happy to adapt aesthetic to the project. We found that tuxes and noses were enough for us, and for our audiences. We're currently writing two new shows, one with NO makeup or noses at all, one with me in a classic whiteface (thanks, Mark!). I have nothing against Sandy, I don't know him. You guys seem to like him and respect him, and as I like and respect you guys, I'm happy to like and respect him in turn. I have nothing against Patrick; I got a lovely Xmas card from him and his family, and I'm happy to support this endeavor here on which I know he works very hard buy purchasing from him on eBay, for example. Or by stirring up the pot, as 'twere. I do not claim to be the funniest or smartest guy in the room. But-as a life-long student of the art of clown, so as to make me funnier, smarter and better at the profession I have chosen, I will ask the question one more time. Patrick says, and I will paraphrase: "Based on these two photographs (and aren't they stunning!) the clown depicted should be immediately snapped up by any one of the major circuses in this country." Now, to my knowledge, the only job where accurate decisions about hiring can be made by viewing a photograph of the applicant is print modeling. Last I checked, there is more to being a clown that there is to posing for a picture...or is there? I understand the concept of "Picture Clowns". I am clearly NOT a picture clown. But I have NO PROBLEM with the concept of picture clowns or the people who are picture clowns. Is this to what Patrick was referring? I think...and here's where it gets dangerous...that for many American Circus Clowns the visual aesthetic is as important as, or even trumps the ability to get laughs from a paying audience of laypeople. Heck, forget laughs. How about provoke a reaction? Now I'm totally cool with anyone here disregarding anything I have to say because a) I didn't go to Clown College; b) they don't think I have anything to offer the world as a clown; c) they don't like me personally. I'm cool with all that. I just want to know what Patrick was talking about. As a student of the art. As someone who wants to know more to grow more. To get better. And if I had a partner who looked like Pat Cashin in makeup, I would probably dress and makeup like a Jandaschewsky. That is where my aesthetic values lie. OK, Pat...about 20 posts in...any response? In this forum, most of us know each other, so when Pat asked why Sandy is not on a circus it was already known that Sandy was a most talented member of the profession. I do agree with the concept that just because a clown looks good, in whatever make-up choice, does not mean that he is going to be funny in the ring. Since this was a specific question, albeit rhetorical, about Sandy, then it goes without stating a known fact that Sandy is indeed talented. ---I am not answering for Sandy, but I have found that the majority of American circus producers don't, or lack the capacity, to appreciate the artistry of performers. This is frustrating for many clowns who can make a very decent living in other employment outside of the circus. In addition -- besides many (not all) producers complete lack of capacity for artistic appreciation, they do not have any sense of humor. If they didn't walk and talk you would think they were completely brain-dead. Thank you, Mike. That's what I was looking for. I look forward to the opportunity to see Sandy perform. You too, for that matter. I was glad to hear the positive comments about you from others, as well as the lively discussions on clowning. Sorry that I couldn't reply sooner. I've had some dental work done over the last two days and haven't really been up to writing much of anything. You asked why I felt so strongly that Sandy deserved to be working in the American circus? Part of it, certainly, is his strong classic look. The glamourous whiteface "picture clown" is an all but extinct breed today, but look at most of the circus posters, tickets, programs and coloring books available from Graphics 2000 (supplier for most American circuses) and you'll see that classic neat whiteface look of clowns like Harry Dann or Ernie Burch are still the most popular images used in America to sell a circus. That's what most people think of when they think of a circus clown. Sandy has that classic, timeless look. The Hamid show still uses Sandy on their website and promotional material. There is a certain magical quality to the neat whiteface that adds an air of quality to any show almost immediately. 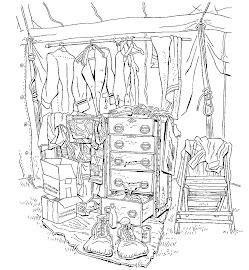 If you've ever seen someone like Dale Longmire and Bruce Gutilla at Showfolks Circus or Tim Tegge or Mike Snider work in a tent you'll know exactly what I mean. 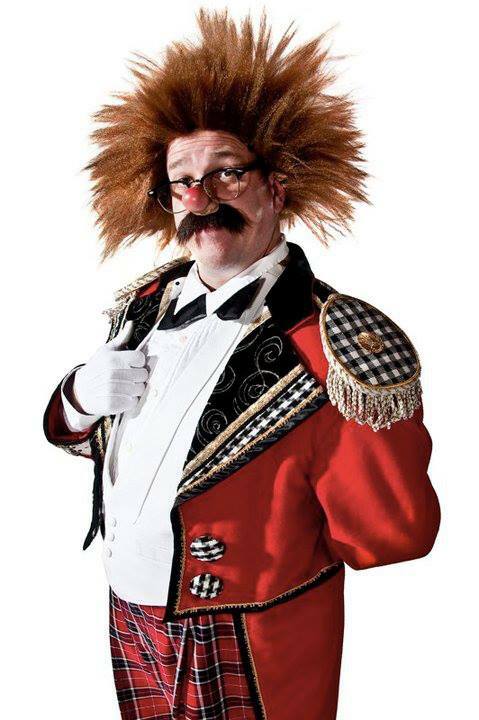 One good picture clown can elevate almost any mudshow into instant respectability in the audience's mind simply by showing them a clown that looks exactly like what they think a circus clown is supposed to look like based on the show's advance materials (free kids tickets, posters). The whiteface means that the show is going to deliver on their promise, anything less breaks the unspoken contract with the audience before the show even starts. That's the power of a good "picture clown". There may be two hundred amateur clowns at the Great Circus Parade this summer but I bet every photographer there devotes an entire roll of photos to Keith Crary. Why? Because, like Sandy, he looks EXACTLY like what we think of when we think of a "circus clown". But that's only part of it. The best designed and applied makeup and the most elaborate wardrobe won't magically change someone into a clown. Look at how much the Shrine clowns spend on Mooseburger and Betty Cash outfits, pro-style shoes, ProKnows noses just like the Ringling clowns wear... and for what? After all that, they still look like what they are. Townies in costume. They lack that magical spark that makes you larger than life. They lack that essential quality that makes someone something else, something more, the thing that makes them a "real" clown. Sandy has that quality in spades. You can see it in these photos, you can see it when you watch him work. He isn't a person hiding behind a makeup, the make only serves to accentuate and exaggerate the person underneath. The makeup allows the clown to become more than a regular person can usually be. The perfect melding of clown and makeup allows the performer to radiate their "best self" in public, the "me" that they hide away from the everyday world and reserve only for family and close friends. You know the Steve Smith "All Day Suckers/Snow of Christmas" speech? The reason it resonates so strongly with Clown College grads who have heard it is simple. Because being a clown allows you to share the best part of yourself with the whole wide world. Good clowns know that. Great clowns can actually do that. Look at Sandy's eyes in those photos, look at his posture, his costume, his makeup. He's clearly someone who loves what he's doing and it shows in everything about him. If you get the chance to watch him perform you'll see that that love is infectious. Audiences can sense it and respond very strongly to it. That's why American circus producers are crazy to not hire Sandy. Because someone like that is a very rare commodity, something that doesn't come along every day, and something that becomes rarer as time goes on. I know the impression that Sandy has left on me. I've seen a lot of circus clowns in my lifetime but Sandy is the kind that I still remember watching almost 30 years later. That ability to connect with his audience and create magical,lasting memories is the reason that I think that Sandy should be in such high demand from every corner of the circus world. Because he can do that, anytime he is given the opportunity, and most people who call themselves clowns can't. And never will. Because when you watch him work Sandy still seems like he believes in Never Never Land and that his heart is the "size of Alaska". Awesome reply. That is what I felt was left unsaid in the original post and it's what I wanted to hear. It was instructive, inspiring and as magical as a good circus on a good day. Yes, as my circus and clown library grows, I learn everyday that I still have SO MUCH to learn about this art, its' history, its' practitioners. That is what this ClownAlley.net is all about for someone like me...someone whose childhood dream was to go to Clown College, and when my opportunity to go came up, the institution was closed. While I am familiar enough with the Steve Smith speech to recite it by heart, there were many other names in the post that I don't know, and look forward to learning about. And to go a few posts up, to drop a line to Greg, perhaps I'll explore my neat whiteface a little more. I have no problem being mistaken for a homosexual; happens almost every day. Happy New Year to all you clowns, and thank you for letting me be a little provocative as I've been feeling a little randy cooped up in my apartment in the crappy winter weather. Way back when --- many new clowns were under the impression that white face clowns that were flashy couldn't be funny in the ring. Ernie Burch wore the flash wardrobe in come-in with his balloon-a-rama, then during the show he wore the coat and pants and hat wardrobe for the gags. When Ernie entered the ring he exploded with animated energy, as did Albert White. It must have been the years under canvas when lighting and sound were primitive and the clowns had to get the audience's attention by physically announcing their own entrance. White face clowns can be funny in the ring, all it takes is imagination and talent. I have been following this blog thread from the beginning, and I have been fascinated by all of the veiws posted. It is very interesting how there is a distinct line in the opinions between the generations of performers. It also reminds me of some of the comments that followed Pat's posting of the Cole Bros alley a month or so ago. To go off on a tangent, I was looking at a photo of the Red Unit clowns from 1983 today and was struck by the fact that almost half of them were whitefaces. Right off the top of my head, I can't think of a show since that's had that many at one time. Currently, between the three Ringling shows, you have 1 (count 'em) 1 whiteface clown. To bring it up to 2, you have to count Gold Unit advance clown Cherie Gregg (who has a very unique style of makeup and costume). That said, I have always thought that a whiteface was the hardest type of makeup to pull off well. There is something striking about a well done whiteface that seems to burn it into your memory. At Clown College, I tried for weeks to come up with a good whiteface makeup. The results were never hideous but they were never quite right, either. So I gave up and came up with an Auguste look that I love and still use on those rare occasions I can be talked into putting it on again. From old school clowns like Harry Dann, Felix Adler, Ernie Burch, Bobby Kay, Duane Thorpe, Flo White, Bill Ballantine to more modern performers like Frosty Little, Tammy Parish, Dale Longmire, Sandy Kaye, Mike Snider, Tuba Heatherton, Jim Tinsman and Peggy Williams (and I'm leaving so many names out) are all instantly recognizable and those names conjure up instant recall to a lot of us. Pat had a great whiteface look during his Ringling career as did Harry Moeller and I have always admired those who have been able to create a good whiteface makeup. Needless to say, there have been just as many Auguste and characters over the years that I admire and who stand on their own, but to me (disclaimer: this is solely my personal, aging and addled brained opinion), there is just an indefineable "something" about a whiteface that says "CLOWN" in great big red and white striped letters and I love seeing them. I can not believe that you left David Kiser off of your list of prominent whiteface clowns. ...and he is in your post photo! !